Should these respondents’ predictions come true, homebuilding is about to get a whole lot more tailored to the final consumer and a lot more complicated between construction contractors. Luckily, construction management software offers builders an integrated solution that promotes efficiency, communication, and accuracy. Holistic solutions—construction management software that offers accounting, project management, and document management all in one system—can, unfortunately, cost a pretty penny. We've weathered the gamut of construction management software options, narrowed down some of the best-bang-for-your-buck software options for home builders available, and listed them below alphabetically. BuildLinks is a cloud-based construction management software is both business intelligent and also a powerful tool for communication. Different players in a construction project have different entry points into the system—they customize permissions for builders, trade partners, and home buyers. BuildLinks makes it easy to complete common accounting functions like bid forms, make a task-based project management solution for each project, and communicate efficiently with subcontractors on each new home. Coolest feature: BuildLinks allows contractors to “score” subcontractors and their bids, so business decisions can be made quantitatively for each job that needs to be done. Capitalizing on the National Association of Home Builders’ 20 Clubs, BuildTools is constantly updating its software to match what the nation’s most elite home builders want from their residential software. Best known for its scheduling capabilities, BuildTools is a complete solution for your entire construction management operations. Construction managers can rely on this software from the start to finish of any home project, while also using BuildTools’s QuickBooks integration to keep their finances in check. Coolest features: Construction managers can use BuildTools’s scheduling feature to communicate meetings, deadlines, and updates to subcontractors and homeowners. Also, offers a portal for subcontractors and homeowners. Price: The first month is $99; after that, their price ranges from $149 to $349, varying only by the number of users and storage space. BuilderTREND has been named a Constructech Top Product over the past seven years—and for good reason. BuilderTREND covers a job from before it’s a project at pre-sale, provides project management solutions to make sure the job is done as efficiently as possible, and even offers a system for clients to log in and submit payment or approve change orders. It has an innumerable amount of awesome features and definitely has the potential to make any picky construction manager happy. Coolest features: Mobile clock-in and out, integration with major software like Quickbooks, Houzz, and Paypal, and a dedicated account manager for all of your customer service needs. Price: One project and unlimited file storage, users, and support for $99/mo. 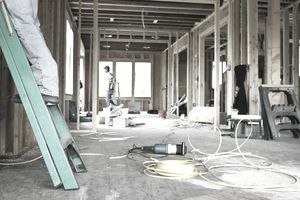 BuilderTREND offers a sliding scale as builders add more projects. BuildSoft Pro is a powerful construction accounting and project management software solution for small to medium home builders and remodelers. Use this product to keep track of your invoices, manage your payroll, create custom job costing, and produce accurate estimates for clients. BuildSoft Pro also offers a powerful project management feature that automatically updates your schedule as the project moves from the beginning to completion. Coolest features: Users can create a “master job,” so construction managers can make a template for future similar jobs. Co-Construct also made the list for Constructech’s Top Product in 2015. Reviewers regularly note that Co-Construct makes their building processes “more efficient,” more “pleasant for clients,” and has helped builders get “ahead of schedule and selling more.” Of course, it’s Co-Construct’s host of features that leaves builders so impressed—from offering task lists for subcontractors to customized branding and marketing for your construction business, Co-Construct offers the tools to make the most out of any home building job. Coolest features: Clients can take and send pictures, make design choices, and submit queries through the app. Integrated Homebuilder Management System, or IHMS, is an integrated database system designed specifically for residential contractors. For construction managers looking for a solution that improves communication across teams—subcontractors, sales, and design especially—IHMS is a great system dedicated to streamlining your communication system. IHMS also offers a powerful executive dashboard that provides tools to manage profitability and financial reporting for construction business owners. If you’re looking for on-site software, UDA ConstructionSuite Residential is one of the best-value construction software options out there. Named a Top Product by Construction Executive in 2015, UDA ConstructionSuite offers an estimating to bidding to building to closing product. It's a powerful document and customer relationship management features move the product beyond construction project management to a broader construction business management software system. Coolest features: UDA merges everything from a general calendar, to insurance tracking, to summary reports, to customer relationship, taking this product a step beyond traditional construction project management software. Price: Scales with features; the Standard version starts at a flat $399 for download.